Protestors carry a sign reading “Justice for E.J.” during a protest at the Riverchase Galleria in Hoover, Ala., Saturday, Nov. 24, 2018. A police shot and killed 21-year-old Emantic Fitzgerald Bradford, Jr. of Hueytown while responding to a shooting at the mall on Thanksgiving evening. Police said Bradford was fleeing the scene with a weapon. Hoover police initially told reporters Bradford had shot a teen at the mall, but later retracted the statement. Prosecutors must turn over evidence about a confrontation that sparked a fatal police shooting in an Alabama shopping mall on Thanksgiving night, a judge ruled Wednesday. Jefferson County District Judge William A. Bell Jr. issued a brief order granting a request by Erron Brown, 20, for evidence in the attempted murder case against him. He is charged with shooting a teenager at the mall. The order doesn't mention police videos, and it doesn't mean evidence is being made public immediately. But Brown's lawyer, Charles Salvagio, said it encompasses all videos from the incident, and that could include the moment when police shot and killed another man at a suburban mall. 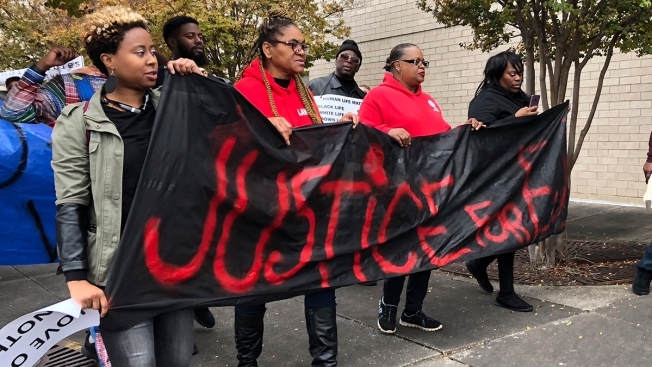 The order comes as protesters and relatives of the man killed by police, 21-year-old Emantic "EJ" Bradford Jr., continue asking to see any video of the confrontation. Citing a continuing investigation, authorities have refused to release video publicly or show it to Bradford's family. Brown's lawyer said he is not guilty. Bond is set at $125,000 for Brown, who was arrested last week near Atlanta. Bradford died of three gunshot wounds to the back of his head, neck and torso, according to a forensic report commissioned by his family. Authorities have said an unnamed officer shot him after seeing Bradford with a gun, which relatives say he had a permit to carry legally.